I wanted to review this book even before I opened it. The title tapped into my altruism and the link to purpose and profit tapped into my commercial drive, so I was interested to hear how Anne Bahr Thompson’s CultureQ research had shaped her premise of Brand Citizenship as the smart way for brands to thrive. The first part of the book looks at how companies are balancing social and financial values through their brands. The examples are from different sectors, most well-known names, tracing our trust in these brands and how this trust can be influenced by current events and the policies adopted by the company. Any concerns about examples being focussed on the USA were shown to be unfounded as soon as John Lewis and Farrow and Ball appeared amongst the companies that ‘do good’. There are many examples of customers’ changing attitudes towards business, often driven by social media, and how the companies responded, from Nike’s adverse publicity around child labour in Pakistan driving the alignment of their brand to their customer’s values, and the Fair Trade movement with its extension from food to clothes resulting in 6.6m hits on Google on The Fashion Revolution Day in 2014. The CultureQ research project and the concept of Brand Citizenship, based on three years of extensive research on moving from ‘WE’ to a ‘ME’ on the continuum of engagement, forms the second part of this book. With trust as the starting point of brand loyalty we read how companies whose brands are seen to do good and do well at the same time can make us feel good about spending our money with them. There are some great examples here of how famous brands have delivered on enrichment (enhance my daily life), responsibility (be transparent and behave fairly to your employees), community (brands that act as a community) and contribution (make me feel that I have a contribution that is bigger than just me): IKEA staying true to its initial purpose: to create a better everyday life for the many people – adapting to changing environmental issues, from formaldehyde in its glue to child labour, by working with charities to improve these areas and now working on how to restore, repair and resell its furniture through customer incentives. This book feels almost up to date. There are qualitative examples from her research of changing millennial attitudes to work and brands, along with Brand Activism driven by ‘post-truth’ (chosen by the Oxford English Dictionary as the word of 2016) aligned to the rise in populism with Brexit and Trump referenced. However, social media seems to be moving the dial on brand engagement at an ever increasing speed forcing companies to respond in an agile way and with transparency of their purpose. Brands like GiffGaff may have a totally different business model from traditional ones and act as a community but are yet to fully evolve. 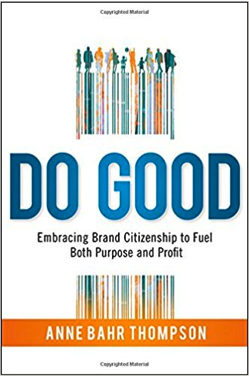 I learnt a great deal from reading DO GOOD both from the experiences of the brands researched and the changing nature of our engagement with them. However, from the perspective of my role as Head of Diversity and Inclusion, the diversity lens is missing in some ways from this book along with how societal change through globalisation and social mobility is changing the way we view brands. I wonder though if people do really make long term decisions on changing to brands that promise a better world…. or is it just a fad, a good intention that falls away in harsher economic times? Is it more American and are we Brits a more cynical bunch? Somehow it felt good to know that an early example of conscious capitalism was Anita Roddick and Body Shop founded in 1976 before ethically sourced products became fashionable. Technology has certainly changed the landscape with social media campaigns and instant feedback having an almost instant impact on brands.